Custom templates help you save time and standardize meetings. Now you can create your own templates and reuse it in your team. Here is how you can start using custom templates. 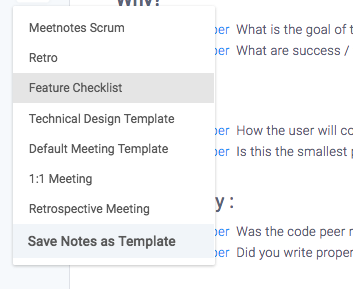 To save a template create the draft notes in MeetNotes Editor and click the vertical ellipses in the meeting header. Once saved, this template will be accessible to everyone in your Team. Saved templates can be accessed from the left menu. The insert templates icon displays the list of all available templates. Select the saved template that you would like to insert. The selected template will be inserted at the cursor position in the meeting.